Living and loving together for a lifetime is not just a human concept. There are many endangered species that thrive in long-lasting monogamous relationships. This Valentine’s Day, let’s celebrate the wonderful wildlife whose devotion to their mate is living proof that love knows no bounds. 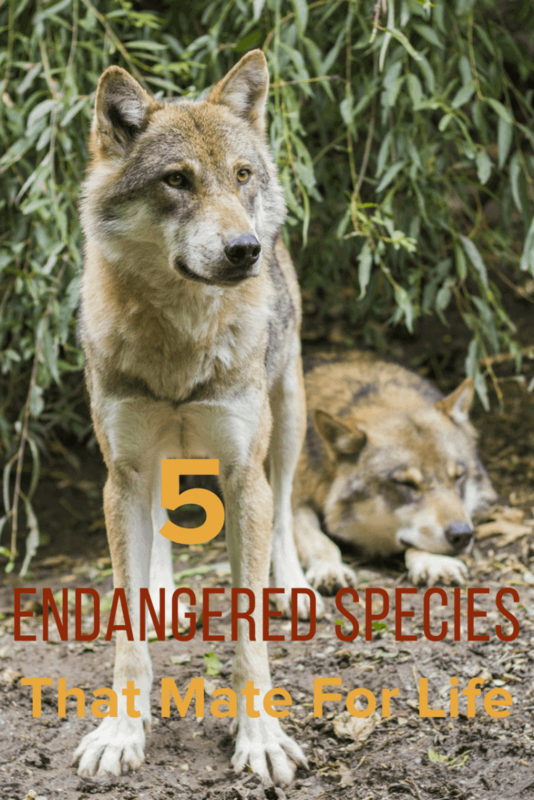 But love isn’t the only thing these endangered species need to persist. Some are in critical need of our help! Gibbons are our nearest relatives that mate for life. They form strong familial bonds and co-raise their young in small, stable groups in the tropical and subtropical rainforests of Southeast Asia. The couple stays in a monogamous relationship that can span decades, producing up to six offspring. These adorable, tree-swinging mammals groom one another and spend quality time by vocalizing their feelings. Their love song, which often involves complex sounds, can be heard for miles. Of course, they have their fair share of problems– cheating, breakups, and re-coupling occur. But these days it’s often hunters cutting these lasting relationships short. Gibbons may be the world’s best acrobats in the forest, but their future is currently at risk due to habitat loss and illegal poaching for use in Chinese medicine. 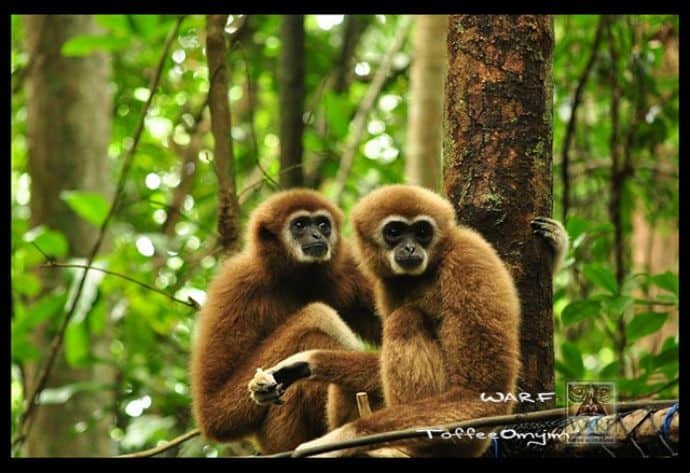 You can show love for your partner by symbolically adopting a white-cheeked gibbon from the World Wildlife Fund (WWF). 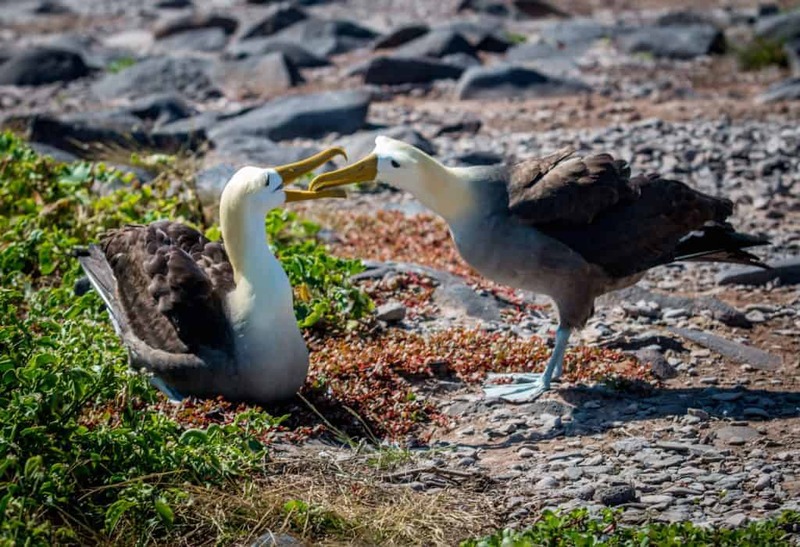 Seeing two Albatrosses engaging in their beak-smacking, ritual courtship dance is a special treat. These beautiful birds woo one another with elaborate dance moves over years. Once the deal is sealed, they stick together for decades. Albatrosses are commonly found on remote islands in the Southern Hemisphere, traveling thousands of miles to forage for food. But they always return to their loved ones. These magnificent birds can live up to 60 years, and the young spend a long time learning the complex mating dance before trying to win over the females. Unfortunately, today they’re severely threatened by long-line fishing (in which they get entangled and drown when they dive for the fish bait), consumption of our plastic garbage, oil spills, and climate change. Since these birds are slow to reach maturity (around five to six years of age) and only lay one egg per year, they aren’t quick to repopulate. 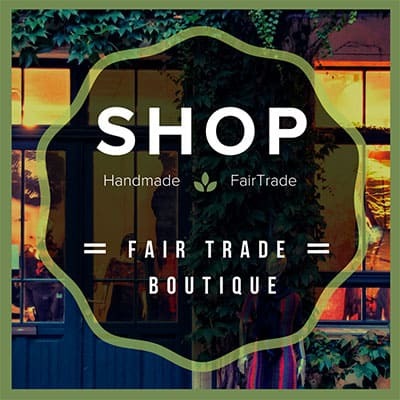 To help the Albatrosses, buy only sustainable seafood, reduce your plastic usage, and recycle. Wolves begin pairing and breeding by the age of two, and build their pack with a new litter every year. 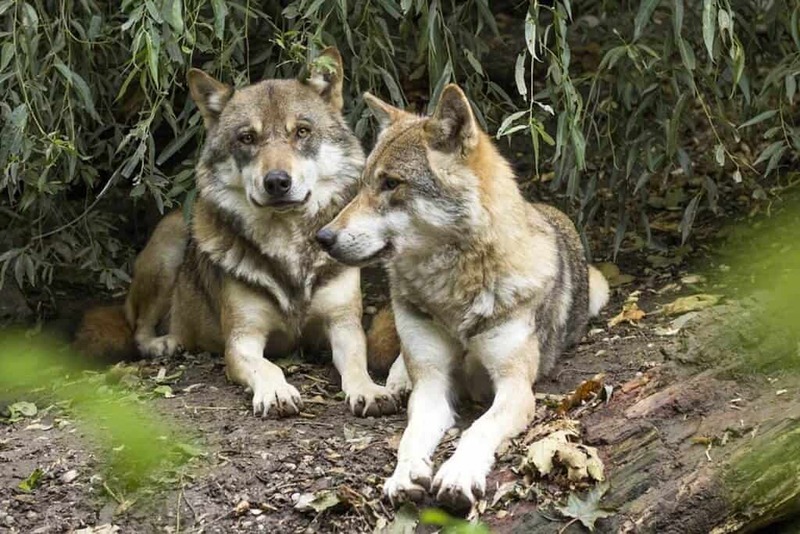 The alpha male and female remain monogamous, and establish the pack’s social structure. They’re prone to mourning their late partner, or nursing a breakup with their mates. These mammals historically roamed vast portions of North America, Europe, Asia, and North Africa. But their numbers are declining fast. For decades, they were considered pests and hunted for sport and for fur. When human settlements expanded, their land began to disappear, causing a further decline in numbers. The Red Wolf of the Southeastern U.S. was once deemed extinct in the wild. But thanks to conservation efforts, it was successfully reintroduced. Show your support for Wolves by planning a trip to a National Park such as Yellowstone. Its northern range is one of the best places in the world to see Wolves. The ideal time is at dawn and dusk, when they are the most active. You can also donate to Defenders of Wildlife, which does amazing work to promote Wolf recovery throughout their natural ranges. They also urge state agencies and legislatures to promote sustainable Wolf management policies. When it comes to everlasting love, the first species that comes to mind is the Penguin. Some species only pair monogamously during breeding season, but the African, Magellanic, Gentoo, and Royal Penguins all mate for life. Each time a Penguin encounters its cherished mate, they show their love by cackling excitedly and swinging their heads. Both male and female Penguins work to prepare the nest and take care of their young together. For centuries, Penguins were hunted for their fat, flesh, and feathers. Because they rely on squid and fish for sustenance, overfishing is contributing to their population decline. 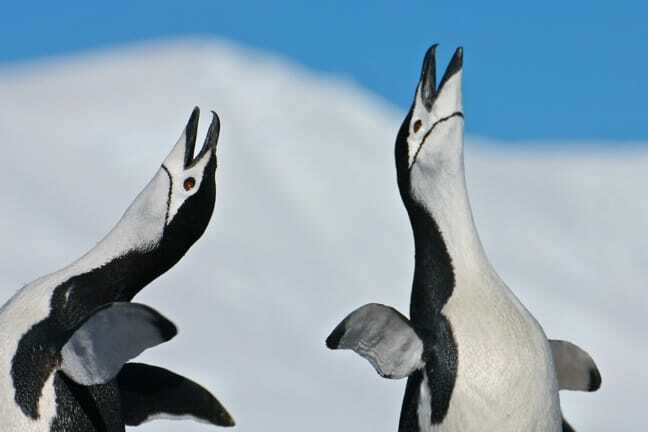 In recent years, increasing water temperature due to global warming is also reducing the prey upon which Penguins rely. They also reproduce at ages older than other birds, making it nearly impossible to keep up with the number of Penguins dying from threats. 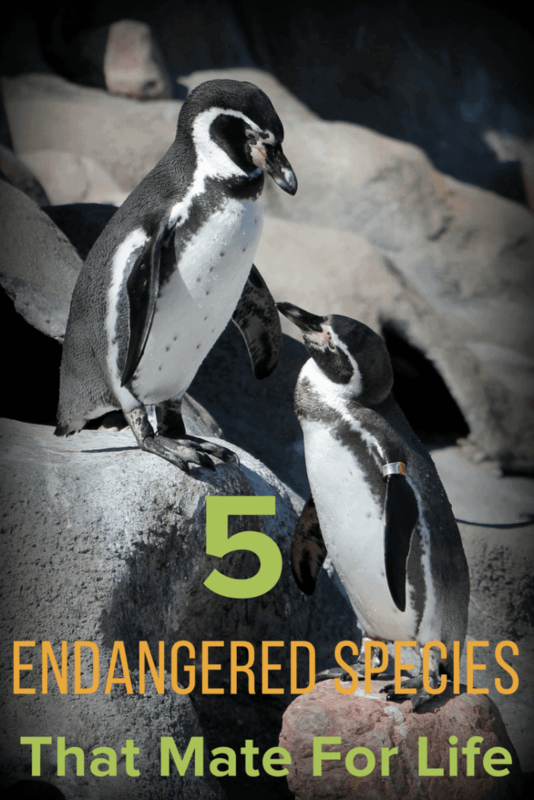 The Galapagos, African, and Magellanic Penguins are among the most endangered species. SANCCOB (Southern African Foundation for the Conservation of Coastal Birds) in Cape Town is a non-profit devoted to saving African Penguins and seabirds. The NGO boasts a return-to-wild rate of 90%. This Valentine’s Day, you can symbolically adopt two lovebirds for the price of one, and contribute to their heroic efforts. Roaming the grasslands of Eastern Africa, the African Wild Dog is also known as the Painted Wolf. They’re undeniably beautiful animals, with large parabolic ears and mottled patches of yellow, white, and black. African Wild Dogs live in packs of 10 to 40, with a monogamously mated pair at the head of the pack. These social canids care for their sick, share food, and engage with one another through varying vocalizations. Their long legs allow them to run up to 35 miles an hour and cover vast distances for hunting. Their most endearing trait is the life-long relationship of the alpha pair: Male hunters return to the den to regurgitate food for the nursing females and pups. Due to habitat loss, disease, and confrontations with farmers (who shoot/poison them to protect livestock), African wild dogs are facing increasing threats to their existence. Their free-roaming land is dwindling due to human settlements and farms. These critically endangered species play a vital role in maintaining the ecosystem by eliminating the sick and preying on the weak. 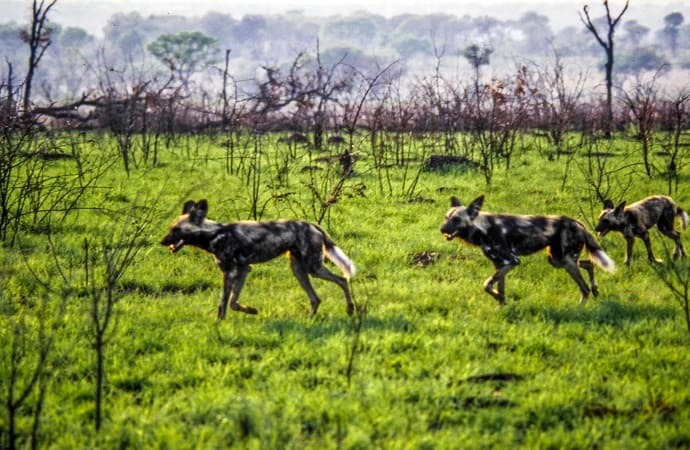 You can help these wild dogs by contributing to the African Wild Dog Conservancy. It may seem as though monogamy is a risk factor in a species being threatened. But it also gives their young a better chance of survival if both parents are involved in raising them. The survival of these and other endangered species rests in our hands.